Is this game supposed to run at like 25 fps? My computer is beastly it can run crysis 3. AggressionSsb Wrote: My computer is beastly it can run crysis 3. Irrelevant. PC games are GPU reliant, and Dolphin is an emulator so it is CPU reliant. Not only that, but it relies on IPC (instructions per clock) so you can't do the "throw more cores at it" concept, the most speed in the fewer cores, the better for Dolphin the chip is. Good chip, but that doesn't tell us anything about the speed it is running at. Please provide more information, such as clockspeed. Also show us your graphics settings please (via pic). It seems likely that you have your settings turned up too high. Hey uh, it appears that the game is running at 100% speed. The only thing that you may be having is a slight GPU thread desync where it's falling behind, and that would be caused by too high internal resolution/EFB2RAM, etc. But, there's no way to make the game run above 30 fps, as it's designed for 30 fps. I've been playing around with the graphics to fix some lag issues I'm experiencing in the populated open world areas (places indoors, mines, or inside/outside my home are fine). The only thing that has worked so far for me is activating vsync. However, activating it causes a text glitch in the game. I've seen other posts about text glitches, but none that matched what I'm experiencing. The solutions/patches suggested were also years old. Simply put, if vsync is on I am only able to see the first letter/punctuation of whatever the NPC is saying. For example, if the text box said "Good Morning", all I see is "G". Pressing A just moves to the next text box. This also happens when the text box is 2-3 lines of dialogue long, and if you wait long enough you can see it trying to fill in the dialogue. Pressing A in that instance brings up the entire text box for reading. If the text is longer than three lines, whatever the last line is will experience the same problem as seen with just one line of dialogue. If you wait too long to press A on the 2-3 line range, the last line will also experience the same error. Currently this is my set up in Graphics: Backend (Direct3D), Adapter is my AMD, Fullscreen and aspect ratio on auto, vsync checked, Native internal resolution. Everything else is default setting. Using OpenGL as my backend produced no differences from what I've seen playing so far, so if I do need to switch back that isn't a problem. Everything else is also basically default with the exception of controller configurations. I'd like to keep vsync checked if possible. It's the only thing that's improved performance for me, but obviously I can't play if I can't see what the NPCs are saying half the time either. 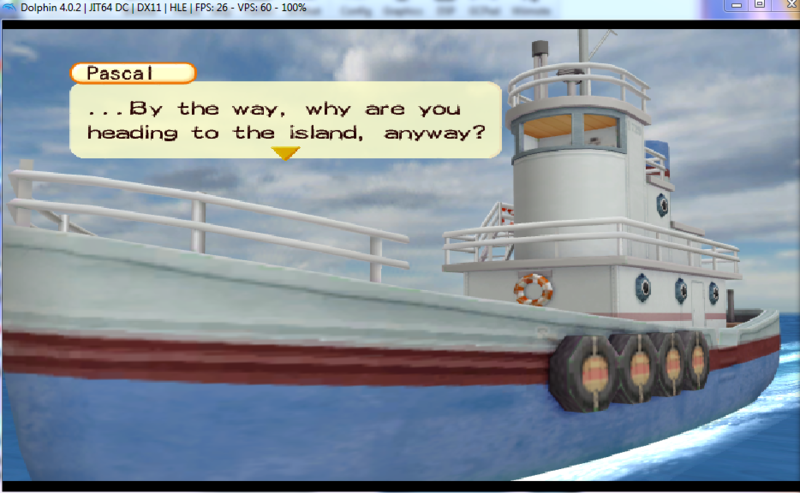 I'm pretty new to emulation in general, and especially with dolphin. Perhaps someone out there who is more experienced knows a work-around or patch that could solve my problem (either the lag or the text glitch). Thanks for taking the time to read my problem! Side note - I apologize if I messed up detailing the computer specs on my profile. This PC is actually my boyfriend's old gaming PC. I get to use it now that he built himself a better one. When it comes to computer hardware and stuff, I don't know much. You're not activating vsync; opening the graphics settings is overriding other settings, including the texture cache. By setting the texture cache to the default, it breaks the text while speeding up the game quite a bit. (10-10-2015, 01:35 AM)JMC47 Wrote: You're not activating vsync; opening the graphics settings is overriding other settings, including the texture cache. By setting the texture cache to the default, it breaks the text while speeding up the game quite a bit. Does that include when I make the changes before opening the emulation? Because that occurs too. It's interesting though that opening the graphics settings itself and any other changes I've made to the graphics settings during emulation have not resulted (yet) in any errors. Only when selecting/unselecting vsync. I'm afraid I'm not too sure what you mean by texture cache though. By the sound of it I'm basically stuck with the slow down, because making changes will break the text. Question regarding XFB and this game. I can run Tree of Tranquility at full speed all the way up until 4k with some AA and AF on OpenGL and Direct3D as of Dolphin 4.0-8072. The only problem is that if I have XFB disabled or set to virtual, the game looks MUCH better but runs at 30FPS and 60VPS and 100%. With XFB set to real, the FPS boosts to 60 along with the VPS, and it still reports 100%. The only issue is that the picture becomes fuzzy and you can barely make any difference between Native or 4k resolution. XFB seems to work differently between Dolphin 4.0-2543 (which is what I use for ToT) and Dolphin 4.0-8072 (which I use for other games) because the screen will shake and jump back and forth with XFB set to real in 4.0-8072. Is there any way to keep the smoother frame rate of real XFB with the visual enhancements of no/virtual XFB? Any help or explanation would be appreciated. I've been using a wired USB XBox 360 controller, emulating as both a Wiimote+Nunchuck or Classic Controller. Sometimes when aiming before doing something, like holding trigger to aim and A to swing hammer/use watering can, the character moves a lot, usually to the left or right. It seems to be different at each boot-up. I've tried increasing the dead zone a few points, although that does not seem to help. Anyone experience this before, know how to fix it? I have run into a strange issue with Tree of Tranquility. I can play the game 100% fine from the start UNTIL I finish the tutorial section and Hamilton takes you to see your house. Then the game hangs on an indefinite loading screen. I've had zero issues up until that point and I have seen someone else have this exact issue as well a few months back (no idea if they've fixed it though). I've tried downgrading Dolphin to see if that would help but the same issue persists. I've done nothing to my settings either so I'm not sure what the problem could be, and no amount of searching has given me a solution either. Edit: I've tested some more and I chose the Town Plot instead of the Seaside Plot. It seems that the game works fine unless you choose to settle in the Seaside Plot.